Ho Hum. That’s usually what the markets say in the summer season. It’s the classical “Summer Doldrums”, named after an area of the ocean (off Africa I believe) that typically has little or no wind to propel a sailing ship forward. Perhaps the “boys” have taken leave to The Hamptons! (?) In any case we’re seeing about average volume on rather narrow (range) bars. Narrow bars pretty much indicate that the Buyers and Seller cancel each other out and average volume, well . . it’s just average. Ho Hum. The blue arrow & line would indicate a double top in chart pattern terms, but in Wyckoff Theory that price structure could be called a UTAD (Up Thrust After Distribution). The problem is that volume really has not confirmed a UTAD, so I’m not thinking in terms of a double top. Instead I’m still on the trading range theory, at least for now. The Money Flow indicator (red histogram at the top) confirms a Neutral flow as well. Trading Range = Summer Doldrums. Growth stocks have been erratic. One day up 2-3% and the next day down. 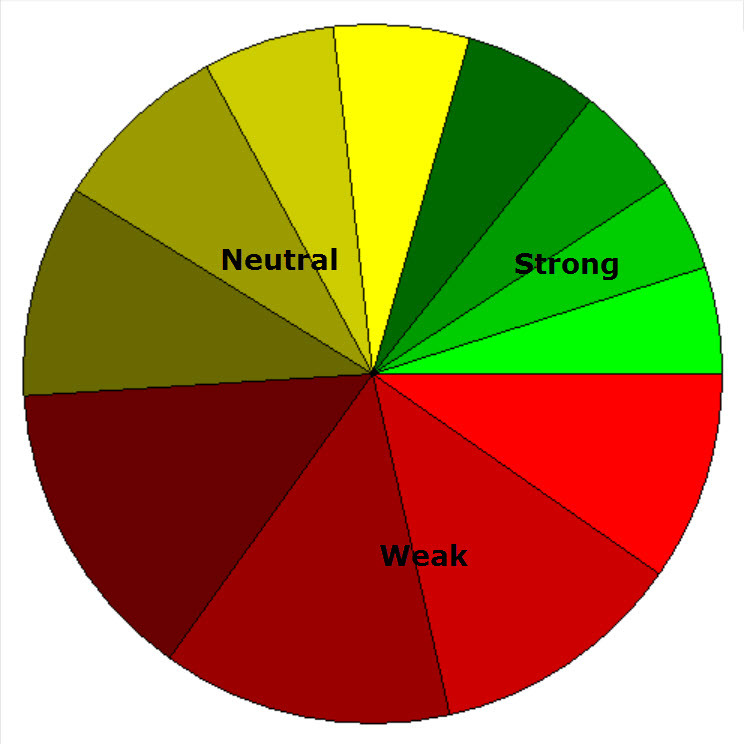 The Price Strength pie chart of the number of stocks in the S&P 1500 shows weakness with more red than green. 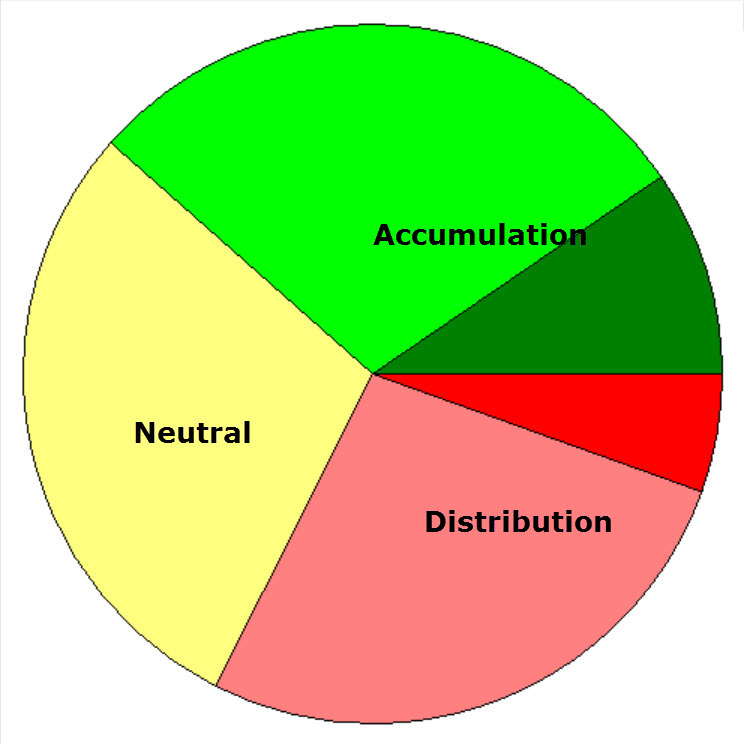 However, the Accumulation (buying) and Distribution (selling) in these same 1500 stocks does not confirm that weakness. Back to a market stand off. 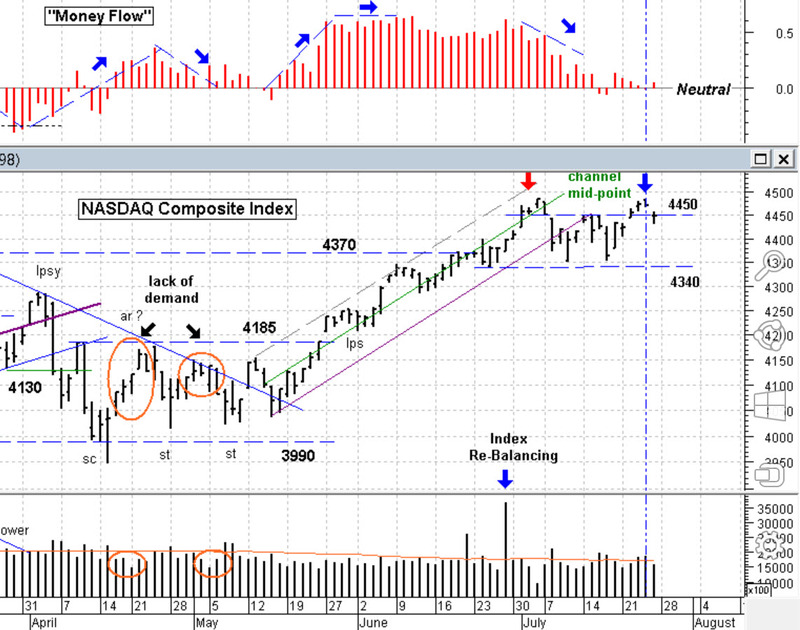 My market sentiment (non price indicators) are negative and my price indicators are mildly Bullish; a mixed result. So what is doing best in the market? I note Real Estate, Steel & Ming, Media, Software and Telecom. Also the lack of solid leadership (Technology, Finance, Industrials). I’ve raised some Cash, but I’m not seeing very many candidates that I’d like to buy. We may have to wait until after Labor Day to see a real trend develop (either up or down). I am surprised at the staying power of the world markets in light of the poor geo-political news though. There have been a few good reasons to sell, but there doesn’t seem to be much interest in that either. Let’s be very selective in here. Surely there are a few stocks “behaving”, and a few sectors as well, but we’re going to have to dig to find them. As I’ve mentioned before: A good investor knows when to row and not sail; especially true in the Summer Doldrums. Have a good week. ……………. Tom …………….